The Workload Reports published over the Easter weekend was not so much a missed opportunity as one that never existed. There is a certain amount of confirmation bias in making this statement as back in November 2015 I blogged Why Workload Working Groups Won’t Work. The blind man of the title is each one of us; we all have a responsibility to act within our sphere of influence. The workload challenge is likely to be one of the defining issues of the next few years; it is looking like one of many. “There are none so blind as those who will not see. The quote above is harsh – “deluded people” – and my ire is aimed primarily at the Government rather than the working groups who were hamstrung from the beginning. The Planning Working Group went for five principles (below); not much to argue with but equally not much added to the workload reduction process in terms of new ideas or impetus. As with all of the working groups’ reports you can find numerous examples of similar information already on blogs. 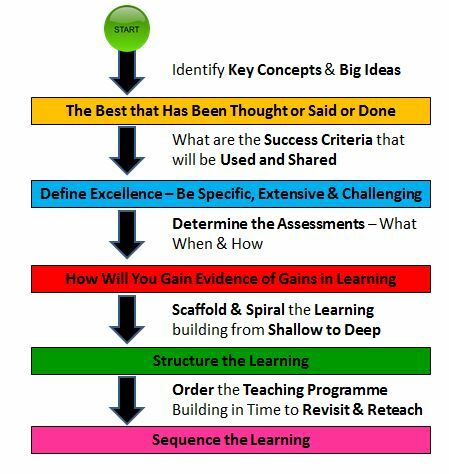 Over the past couple of years I’ve written about our processes using images like the one below. Instead of the recommendations made, imagine if the group had recommended that the government immediately stops the curriculum changes that are already in the pipeline and rescheduled them into a more appropriate timescale. It was never going to happen; it would not be allowed to despite the fact that far too many examination specifications, for teaching from this September, have yet to be signed off. It may arguably be counterproductive as so much work has already been done by teachers; with far more yet to do increased workload is built in for years to come. The Marking Working Group recommended “that all marking should be meaningful, manageable and motivating”. 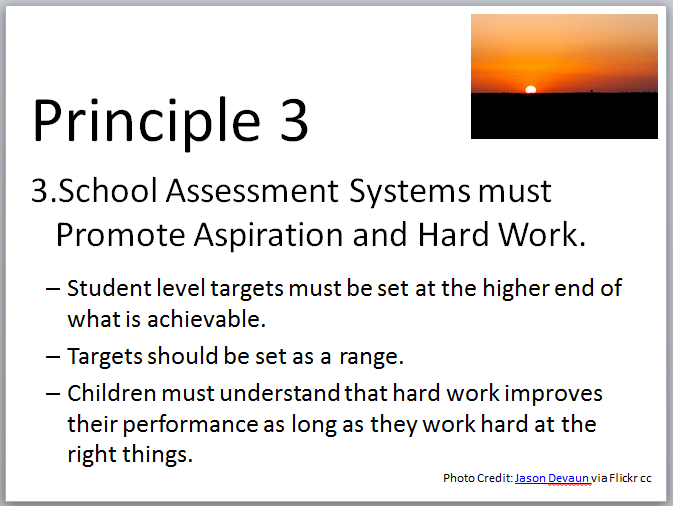 Again difficult to argue with given the principles from a blog twelve months ago on Life After Levels: An Assessment Revolution? The Marking Working Group were spot on when identifying the Department for Education and Ofsted as key culprits (add to this senior leaders like me and you have pretty much gathered the sinners together). However the recommendations fell way short of anything that would have a modicum of real impact for teachers. Imagine a couple of different recommendations along the lines: the Department for Education should immediately cancel this year’s teacher assessments for writing at Key Stages 1 & 2 or Ofsted should cease to inspect good schools with immediate effect. Throw in a repeal of the School Information Regulations (2012) – a lot of the information is on-line elsewhere and many, though not all of the other requirements, are viewed by so few people as to make the not proportionate to the time taken – and you sense you have a government which is serious about workload. Being required to “disseminate the principles and messages of this report through system leaders” isn’t exactly a workload buster or overly onerous on the DfE. 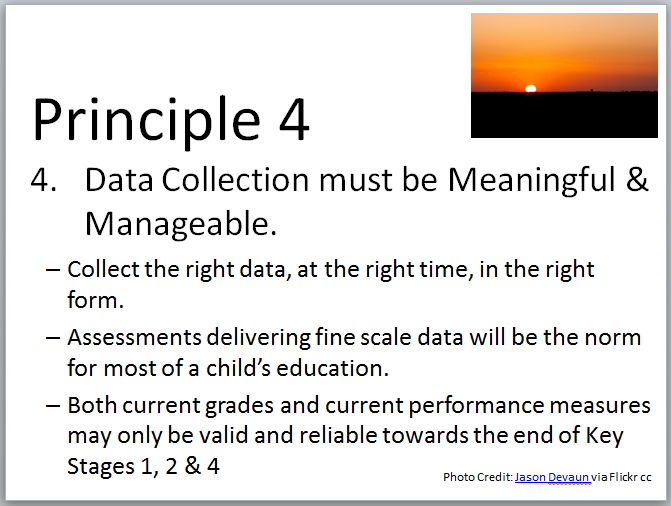 The Data Working Group didn’t really offer very much more; don’t collect data you don’t need, don’t use or has limited impact on pupils’ learning; sound advice. The reports have come and gone; two of the main culprits won’t do anything much to help and given the DfE owned these reports they are the most culpable. Having been unbelievable negative – apologies, despair is an easy go to emotion in these situations – this won’t excuse me or other school leaders from acting where we can. I think we are probably workload neutral at the moment; no better or worse than last year though I think we have set up systems where the work being done is more useful to the class room teacher. Productive, useful work feels better than unproductive, useless work even if they take a similar amount of time. It’s a start but “requires improvement”. Policies have been written and put on shelf until later in the year when staff will hopefully have a bit more time; a number of key current policies, for example attendance and behaviour will undergo a workload review once the SATs, GCSEs and A-levels have been done to see how we can make them more efficient and we are looking to see what we can ditch that no longer serves a purpose or requires disproportionate effort for limited impact. Trying to enhance staff’s work life balance with the amount of change created centrally is daunting; I’ve always liked a challenge, I’ve not always been successful though. Teachers tend to blame school leaders for workload. School leaders tend to blame the government. As a school leader, do you put all of the blame on the government, or would you say it’s about 50/50? 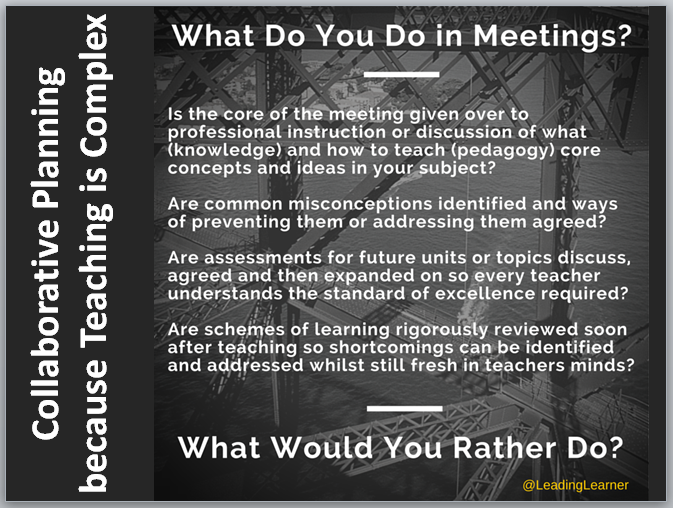 In the post above identified “three sinners” – DfE, Ofsted and school leaders. Might also add getting some teachers to stop doing things that are not productive can be really hard too. Having written on school delusion and design, would you (your team) value a free session on this topic…you are after all a leading learner which I like and admire…I wonder if your schools are truly spiritual places in an organisational sense. I’ll look them up to learn more…but you are right on workload and fixes and add-ons!